Imagine if America's founding fathers had gone with monarchy instead of democracy, but with really great leadership training so we had 'better kings'? Intrapreneurial project teams pitch improvement ideas against the ‘open source operations model’ of the organization, including all processes, systems, assets, and operational roles transparently modeled inside a Wikipedia-like collaborative software system. This operations model provides an ongoing organizational core of stability and efficiency that ad hoc project teams can work on and around to provide innovation, adaptation/change, and engagement. Organizational resources not dedicated to operations – including money and employee time - are available for investment by mentor investors. Employees may hold a dynamic portfolio of many different roles - including part-time mentor investor, project leader or contributor, and/or operational roles - and are accountable for their voluntary commitments and overall utilization via peer review. They can shift their role portfolio over time to stay in the engaged and productive Flow zone – not bored, burned-out, or overwhelmed. Power shifts from abusive and controlling – based on position and fear - to balanced and mentoring - based on respect, trust, and expertise. Transplants Silicon Valley’s innovation ecosystem inside the organization. Innovation flourishes as intrapreneurs and self-organizing project teams can pitch multiple potential mentor investors for sponsorship. They only need a single ‘yes’, as opposed to ideas being killed by a single ‘no’ anywhere up the traditional hierarchy. People are more engaged and passionate on small intrapreneurial teams - like they are at startups. Proactive, bottom-up, self-organizing initiatives instead of reactive, top-down assignments. Internal markets for talent, ideas, and money instead of political power struggles. Open and transparent organizations instead of siloed and opaque. Nobody ‘owns’ employees anymore, reducing fiefdoms. No more communication limits like those typically found in hierarchies, especially when it comes to bypassing the boss. 1) Invest time in establishing corporate principles and value, and ensure that corporate and project level goals don't conflict with that. You have worked on progressing encouragement for ideas. Was that a problem? If so then of what kind was it? That means was the problem with reference to motivation or was it in reference to innovation? If it was in reference to motivation then how much will an organization set aside for creating an atmosphere of entrepreneurship without disturbing focus on its core activity? How many investor teams will it set up? How many internal angels will put their hands up to give time to the crazy? And if the problem was with reference to innovation that means an innovation means was in place but did not work satisfactorily and your work/concept will handle the load. Fine. This leads me on the prime question in my mind in response to your hack: What is the real problem confronting any 21st century organization? Is it thinking what and where to invest or is it progressing wisdom that they believe in? Today the ability to follow beliefs is threatened by globalization, technology, interactions, specialization and extreme competition. i am a boss who has risen to her highest level of incompetency. (peter principle) i fought this process tooth and nail from the beginning. i wanted to be a co-worker among workers, and decisions made democratically. i guess it is just so much easier to let someone else make the decisions and take responsibility for the results. this was fine as long as i knew what i was doing. my journey in this company has been trying to lay road in front of a moving vehicle. my solution? instead of restructuring the company.. hire more people! hoping for a better balance... or proof of the typing monkeys theorem. i am miserable. Hi Raj. Thanks for the kind words. In Silicon Valley, even the earliest angel investors never get to become boss/tyrant of the startup. The nature of the relationship does not allow it (although they may certainly influence the board). The Bossless Organization keeps the same structure for mentor investors. If he doesn't like the direction the project is going, he can certainly withhold future funding, but the team can approach other mentor investors to step in. In my valiant search for a champion for my breakthrough I found they, as a tribe, are extinct. That assumes they did exist once upon a time! Perhaps their role has been surrendered to VC's. That's a pity for I believe money for skunkworks, not necessarily conceived by company personnel, must always be there to keep the spirit of the possible alive. In fact, senior personnel should be evaluated on the successful skunkworks they have fostered. So it was a delight to read your idea of actually creating the tribe in a company. I pray it prospers. Having offered the prayer I also wish to state that there is merit in a 'NO' provided of course the innovation has the power to attract some adherents. The debate between the 'NO' and the 'YES' emerges the reality and it is this that is of value to the company. This power of reality is lost in your proposal of multiple individual bosses where it appears to be sufficient if one moneybag is willing to take the risk. This is not without risk for the innovation since nothing prevents the 'boss by choice' from becoming a tyrant a few milestones into the project. Thanks, Alex, for the analogous story. I didn't realize IBM operated this way (somewhat). I totally agree that some sort of online marketplace is required to help match ideas to sponsors/MIs. And employees need to be evaluated comprehensively based on their overall portfolio of roles, inc. 360-degree and peer feedback. Single-manager reviews will have the exact problem you describe. This is a valid concept, but not so new, as I have had similar experience with a this kind of organizational structure at IBM. While employed as an Information Security Consultant in Toronto, I was also engaged (on the side) in a global Enterprise Of The Future project to define future services required to support IBM's "Business On Demand" strategy. Although my proposal for "Trust Enabled Computing" as a deeper play was approved, it still required a line of business sponsor to be implemented as a pilot project with a client. That's where things got a bit more difficult. In my mind, what seemed to be missing at the time (in 2003) was a structured approach for soliciting the support of sponsoring executives. The other missing link to consider in this hack is the issue of how employees' work on a side project is perceived and valued by the portfolio-holding (employing) manager. In my case, my management took a narrow perspective of my value to the organization, ignoring my global contributions, when they assessed me to be too expensive to retain in my local role during a downsizing cycle. I would characterize this hack as an improvement to existing management practices. Thanks. I think a middle manager could implement this on a smaller scale within his domain, esp. if he has another layer of managers below him (instant Mentor Investor group) and gave even the lowest level people in his organization discretionary time and/or money to invest (like Google's 20% time). That should be enough to create the internal market. Such an experiment could spark adoption by the larger organization. Tory, thanks for this great hack. You flesh out so many of the key shifts and mind flips required to recast our organizations as more human, inspiring, adaptable, and innovative. It's an important vision you're describing—it's also pretty radical. I'm curious if you could propose one high-leverage experiment that might create the spark for this larger journey--and one that an innovator other than the CEO could stage. Chetan has a hack with some supporting assertions on the systemic, emergent dictatorial nature of the boss-subordinate relationship, as well as the futility of the leadership training approach (although I have reservations about the voting solution). Thanks, Annie. I'm not sure how to reframe the Problem section in a more positive light. I do realize it's a bit harsh, and tried to soften it a bit with a new opening. I do prefer to be more positive and aspirational, but McKinsey communications training hammered into me that the problem has to be compellingly negative enough to spur action. If it's soft-pedaled with "things could be better", I'm not sure people are as motivated to engage. Sigh. It's a tough one to get right. I like your idea on summing up benefits for employees, managers, and the overall organization, and I added them to the Practical Impact section. Thanks for the great suggestion. Let me know if you think I missed some. I like this idea. I don't yet have a build for the actual content as I am still wrapping my mind around it and all the implications but clearly these ideas are promising. I have a suggestion about how you have framed the "Problem". Right now you have framed the problem around an (occasional) dysfunctional relationship with a boss. But this is a good idea even if you have a great relationship with your boss! I would frame (and totally ignore me if you find this suggestion annoying) the problem in much bigger and greater terms and I would frame it in the positive... so not what you want to get away from, but the kind of relationship you want to move toward, or the missing ingredient this idea will deliver. Catch my drift? The added benefit is that then managers can see what they will get out of this great idea too rather than needing to defend themselves. And then maybe, though clearly this is not required, and may not be appropriate at this stage, it might be cool to explicitly lay out how "employees" will benefit, how "managers" will benefit, and how business goals will benefit. Then if I am an organization looking to put your idea to use, I know all the great stuff I'll get from it. Just some first impressions. Thanks, Erika! To expand on the open source operations model: the thinking is that mentor investors and self-organizing project teams are great for innovation, expansion and improvement, but they're probably not the right model for the day-to-day running of the core business, i.e. operations. That requires transparent, documented operational processes ('open source code'), and, more importantly, roles in those processes. Mapping this to your "Soft R&D" model (http://www.managementexchange.com/content/soft-rd-you-dont-have-be-geeky...), the labs are project teams, but their end product - revised role definitions and 'moves' (the "TANDBERG Way of Doing X") - would be the operations model. The open source operations model is the game, while the labs are project teams tinkering with the rules for innovation, adaptation, and improvement. In fact, my first reaction to reading your story was that alternate labels to your "hard vs. soft R&D" would be "product vs. operations R&D". And you could definitely think of the operations model as having version numbers. 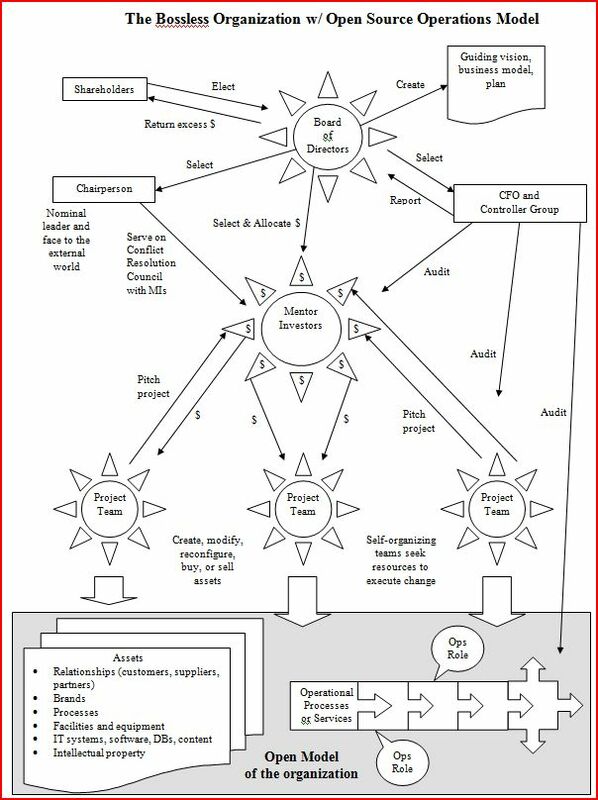 You might also find the attached image and the charts on p.14-18 of the attached pdf helpful in detailing the open source operations model and putting it in context with the overall framework. On edit access: It turns out I did have edit access. When I went to the hack, only the first 3 fields offered a small 'edit' link (so I assumed there was no edit access to the other fields), but there was also the Edit tab to edit the whole thing. Erika: Source Integral looks fascinating. I am also ex-McKinsey and a big fan of Wilber and Integral. I'd like to learn more. Please let me know the best contact email for you at tgattis (at) openteams.com . Thanks. Many organizations have experimented with internal market places for capital investment projects and other types of projects but I have never seen anybody take that idea to an organization-wide scale, using such a tightly constructed frame. It might be that IBM has attempted something like this - we would need more details from Alex or other IBM-ers to be able to validate this claim - but from the story Alex does share I am not sure IBM got beyond Phase 1-2 of the blueprint you describe. Your description makes it quite easy to imagine what the transition from "boss" to "mentor-investor" would look like in the context of projects. Where I struggle a bit to visualize the transition is in the context of operations. Under the tab "First Steps"/Third Phase you mention open source operations model. Could you perhaps elaborate on that? It would help - at least me - to visualize the end-state of the transition you propose. P.S. Are you sure you don't have edit access to your hack? Periodically, I lose edit access to my story as well but it comes back. Maybe you tried to access your hack while the website was being worked on... Else, I would click the black feedback tab and ask for edit access. A clarification on the Problem section (since I no longer have edit access to it): upon re-reading, it seems overly harsh. Please don't be offended if you yourself are a boss. Obviously the majority of bosses do not exhibit most of these traits, but I think most would agree they have seen this behavior somewhere in most organizations.